January is my month to purge. From boxes of unused trinkets and tools to clothes / toys that my daughter has outgrown it feels so good to declutter. I think I love decluttering so much because it creates a sense of control and comfort at the same time. I FINALLY know where that sweater is that got shoved in the back of my closet. I’m currently in the process of decluttering my life, but also taking a different approach in 2019. This approach is compartmentalizing what I DO have. Tidying. Creating categories of things and labeling brings me joy - and I’m just getting around to it in my home (room by room). I finally got a chance to apply these techniques to my life and business and the results were impressive. I started 2019 with a list of lackluster goals, a google drive full of disorganized files, and finally a plan of attack on those goals that looked like a connect the dots and color by number overlayed on top of each other. I know myself and I’m a big thinker - but I needed to seriously declutter my goals and use some of the key tactics in cleaning to help me incorporate my lessons and be practical when it came to designing where to focus my efforts this year. 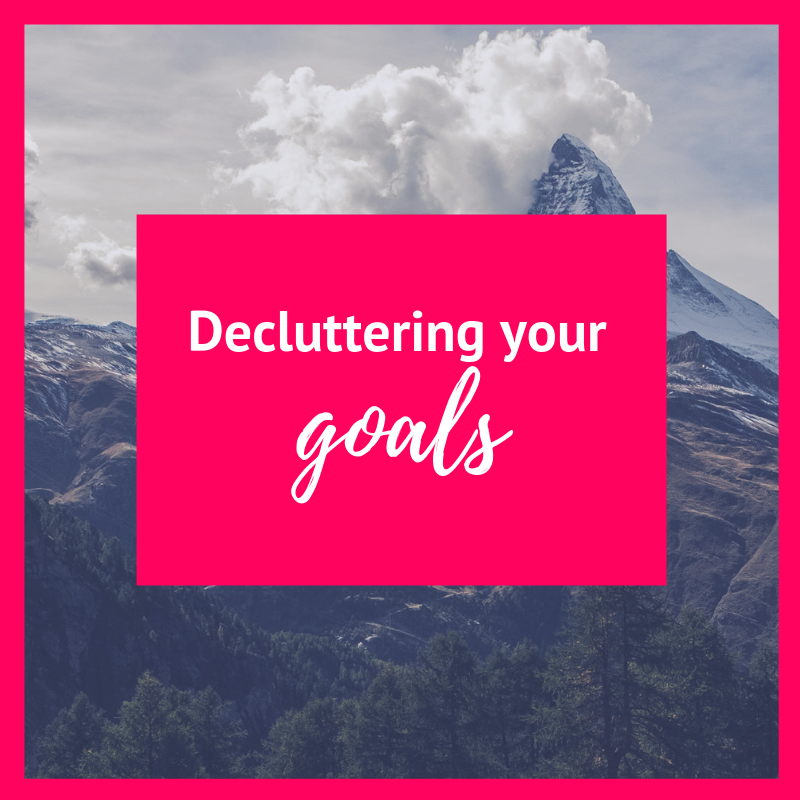 Here are my top tips to decluttering your goals! Type out all of the trainings, career ideas, business plans, courses and ideas you’ve been floating in your head. *Be sure to start with the uncategorized list first, you’ll aggregate these after the fact. 2. Create categories of your goals - trainings, strategy, personal growth, health, financial, etc. How many items are under each of them? What is the ultimate goal for each of the categories? Based on your list, identify which ones are the most important to reaching that goal. The focus here is to do LESS but get MORE. My favorite part of this exercise is step 3. This was such a game changer. If I don’t do this, will it matter? Does this goal lead into something bigger? What if I focus more attention on another goal instead? Would it be ok? Will this goal matter to me in January 2020? Where will this goal take me in 2-3 years? 4. Example: Here is my own descriptive list of goals that I turned into simple and straightforward goals for this year. This doesn’t mean that I won’t achieve more or do more to get to this - but these are the main priorities and will help me move the needle this year. *Side note, I had a hefty list of goals, but after doing this exercise the things I really cared about ended up on this notebook. If you’re having a hard time getting started on this, I totally get it. Goal setting takes practice, considerable thought and sometimes complete outside perspective in order to get it right and achieve the milestones. What I’ve learned in my time as a client and as a coach is that the difference between simply goal setting and achieving those goals is accountability and unrivaled personal support. If you’ve been putting off your goals for awhile, or reusing the same goals, I invite you to welcome accountability and support into your life. Create more ease both with the actions you take and the goals you achieve in your life and career. There’s no time like now to figure out what you might achieve with the right tools and support. I invite you to book a a FREE coaching session with me to prioritize YOU and what YOU want. Coaching is unrivaled in the amount of impact it can have on you and moving you forward toward what you really desire in life. If you’re on the fence, book the call and give your goals a much needed boost! Here’s to your 2019 goals!